I have a loft/play area at the top of my stairs (just outside the baby's room), so rather than use the standard gates that you wedge between the walls and can still tip over, I put a swinging /locking one in. My daughter is only 17 months old, so this could easily be here and need for a few more years. It only needed 6 screw holes in the wall, so even if it's removed then holes can easily be filled in. 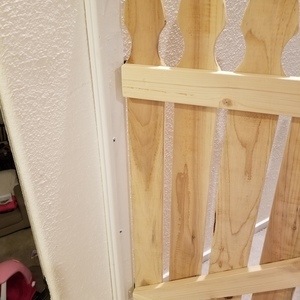 There wasn't a stud where I wanted the hinges to be, so I attached a brace to the wall with butterfly anchors, and then attached the hinges to that. I used 1x3 boards for most everything. I drew a very simple (not too sharp) design, and just used a palm router and sander to give it the shape. Remember that this is for kids so sand the heck out of it and make it as smooth as possible! There's no screws in the actual gate, just a lot of quality wood glue that was held in place with clamps to dry. 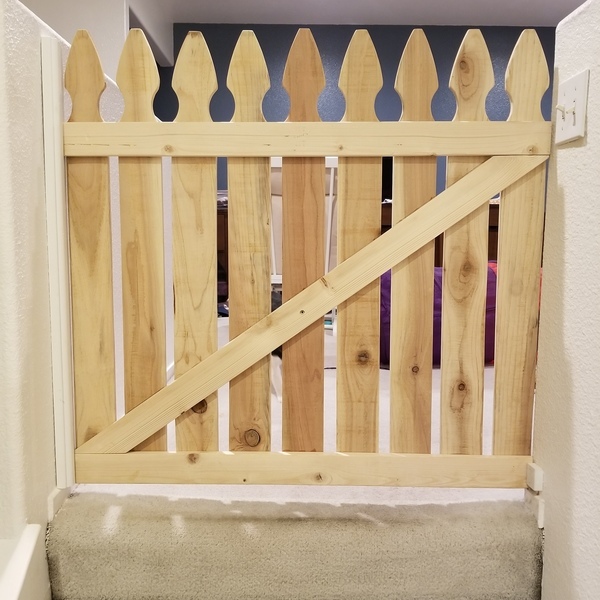 I have a loft/play area at the top of my stairs (just outside the baby's room), so rather than use the standard gates that you wedge between the walls and can still tip over, I put a swinging /locking one in. My daughter is only 17 months old, so this could easily be here and need for a few more years. It only needed 6 screw holes in the wall, so even if it's removed then holes can easily be filled in. There wasn't a stud where I wanted the hinges to be, so I attached a brace to the wall with butterfly anchors, and then attached the hinges to that. I used 1x3 boards for most everything. I drew a very simple (not too sharp) design, and just used a palm router and sander to give it the shape. Remember that this is for kids so sand the heck out of it and make it as smooth as possible! 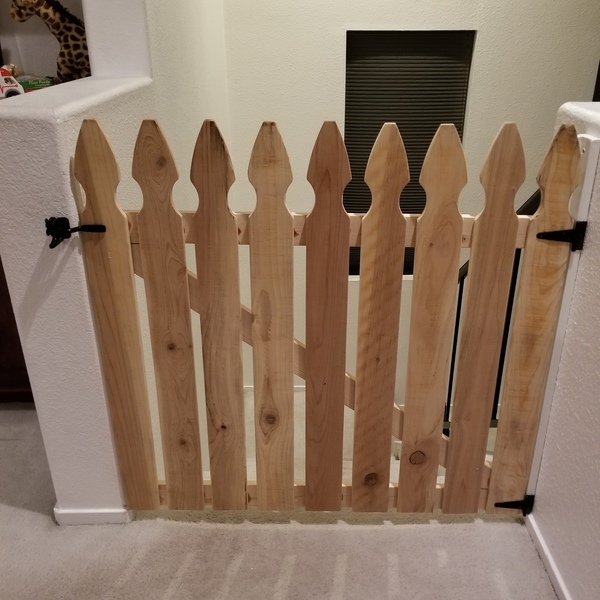 There's no screws in the actual gate, just a lot of quality wood glue that was held in place with clamps to dry.